Aside from my early days of cooking on my own (think of dry turkey burgers and pasta with Ragu), I haven't had too many tragic cooking disasters. Cooking seems to be a skill that I have cultivated in myself quite well. Baking? I also do that pretty well. Frosting cakes?? Yeah, not so much my thing. No matter how many times I have tried to or how many tutorials I have read that were supposed to make frosting a cake easy, peasy, I still manage to frost the most ugliest cakes. This past March I decided to do what I swore I would never attempt again. Yep, I had convinced myself that I could make my husband an amazing tasting and beautiful looking cake for his 35th birthday. I wanted to make him a red velvet cheesecake cake with cream cheese frosting. This cake was literally a 4 layer lake- a layer of red velvet cake, a layer of real cheesecake, another layer of red velvet cake topped with another layer of cheesecake. Perhaps I had chosen a bit of an overambitious cake to make. I baked the cheesecake myself from scratch. I have to admit the red velvet cake layers came from a cake mix. The trouble started when I tried to slice the cheesecake in half lengthwise. It looked SO easy pictured in the recipe. Quite a different story in my less than experienced hands. The cheesecake cracked in multiple places. I tried to slide over the first half onto the cake layer and it started to sink off to the side. Somehow I got all the layers stacked, but it was not pretty. I slathered on the cream cheese frosting hoping to camouflage my very unattractive cake layers. The photo below doesn't look too bad. My high school carrot cake was MUCH uglier But it was a real mess when I started to cut pieces from the cake. I think maybe 2 slices came out looking somewhat pretty. The rest were just globs of red velvet, cheesecake, and frosting. Once again, I made an amazingly delicious cake that looked like crap. At least yours tasted good! Mine looked nice and was disgusting!! no where does it say cheesecake has to be pretty! that cake sounds crazy to make, very ambitious! 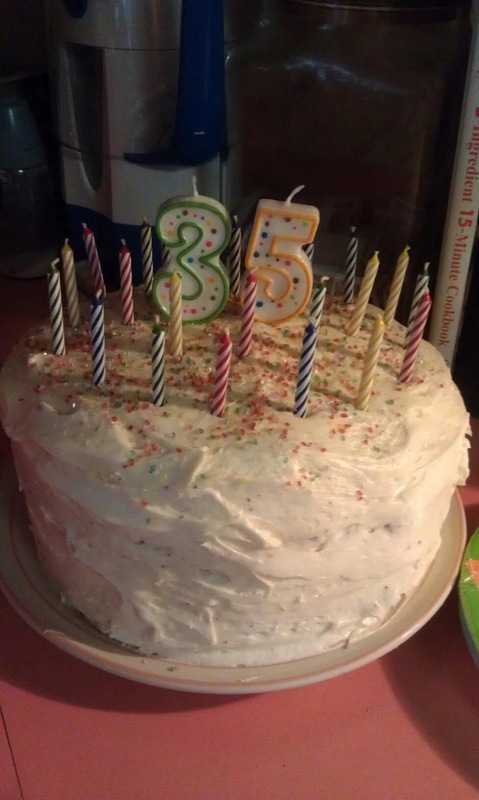 I thought it sounded perfect for my husband because it combined his 2 favorite cakes into one. ;) And granted, all of it was either ate at the party or gone by the day after. So, it did at least taste amazing, lol!